In my professional travels in developing countries, I’ve been amazed how analogous work methods are to those used in America in the early period of our trade history. Several years ago we had the opportunity to join our son in Kenya where he was finishing his junior year at UMass. As Peace Corps volunteers in the early 1970’s in the northwest corner of Kenya near Uganda we hadn’t an opportunity to explore the coast despite my interest and experience as a wooden boat builder. Knowing the era of traditional construction of wooden Lamu dhows was declining, we took the opportunity to fly from Nairobi to Lamu Island in a small plane to sail a dhow and explore the construction and maintenance of these venerable vessels. Lamu Island is located on the Indian Ocean on the northern coast of Kenya about 60 miles south of Somalia. The island had been the center of dhow construction for several hundred years and has not changed the construction techniques or the general structure in all that time. 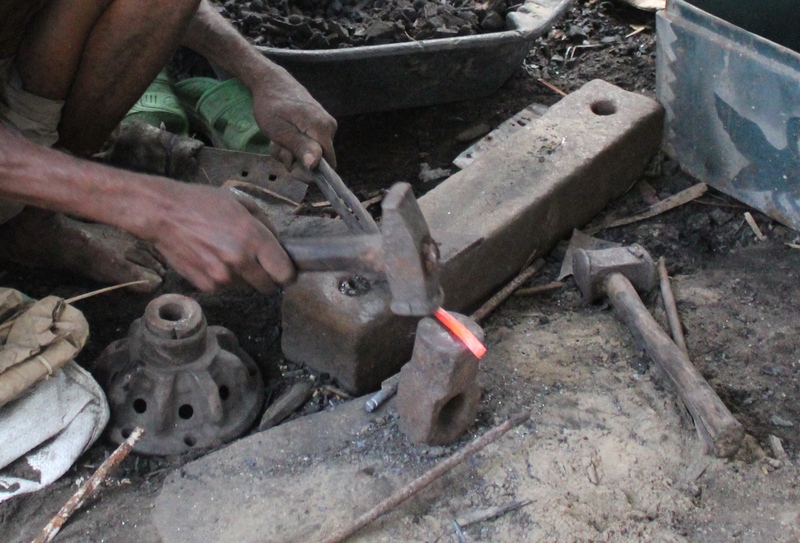 All of the construction is done on the island, from selection of ribs in the endless mangroves that surround the island to the forging of all the fittings that are used in fastening the hulls of the boats. Consequently it’s a time capsule and a window on the entire construction process. In many respects it’s an analog to the methods employed for shipbuilding in America two centuries ago, but with much more basic tools. Since my son and I are amateur blacksmiths, we made sure we saw that component of construction. After sailing along the coast in a hired dhow we moored on the northwest side of the island at the small town of Matondoni, famous for centuries as a boat building center. There were a number of dhows and other small craft under construction or maintenance along the shore. 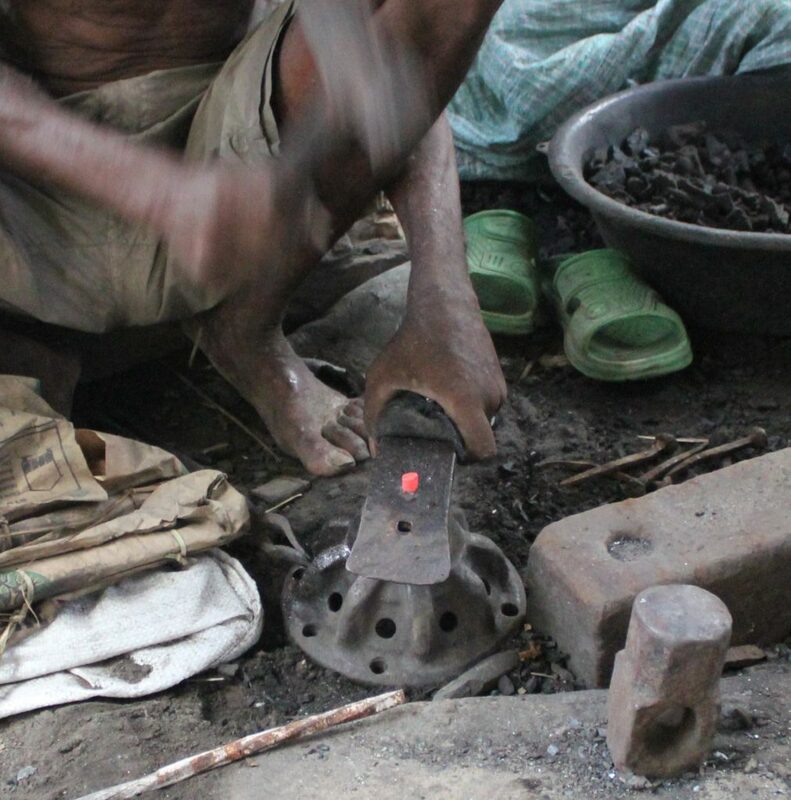 After enquiring about forging of the nails and other fittings for the boats we were led through narrow passages in the crowded village to a small rectangular shelter made from palm leaves on a bamboo frame. We were introduced to the elderly occupant who was seated on the floor before several pieces of random iron and a small fire. 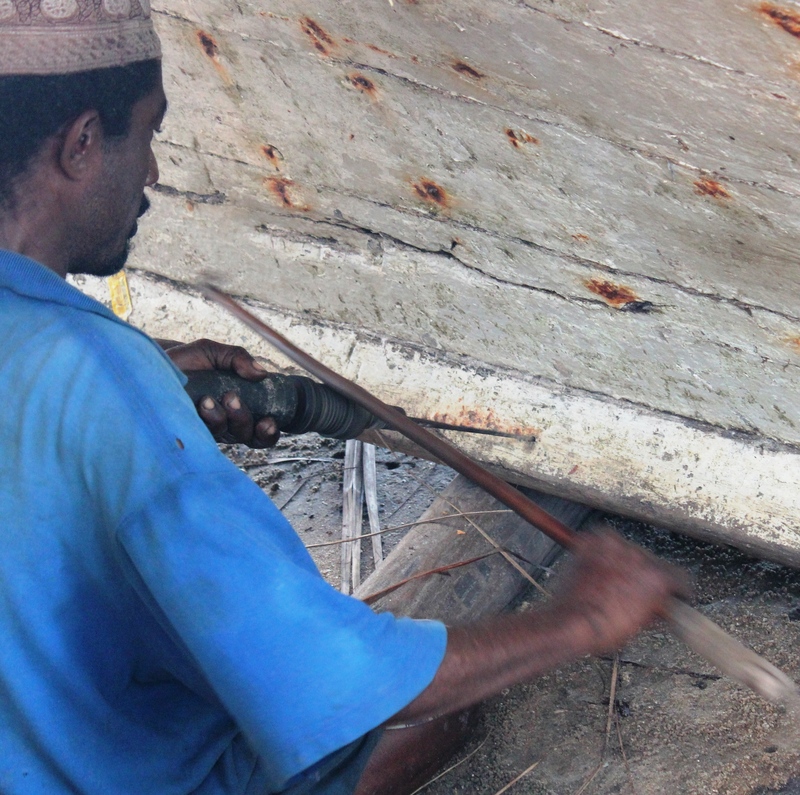 He was the nail maker for the boatyards in Lamu and also sent nails down the coast toward Mombasa. He also forged other fittings, but his primary focus was the very long tapered nails that fasten the ribs together and the planking to the ribs, hence are of vital importance to the integrity and water tightness of the hull. 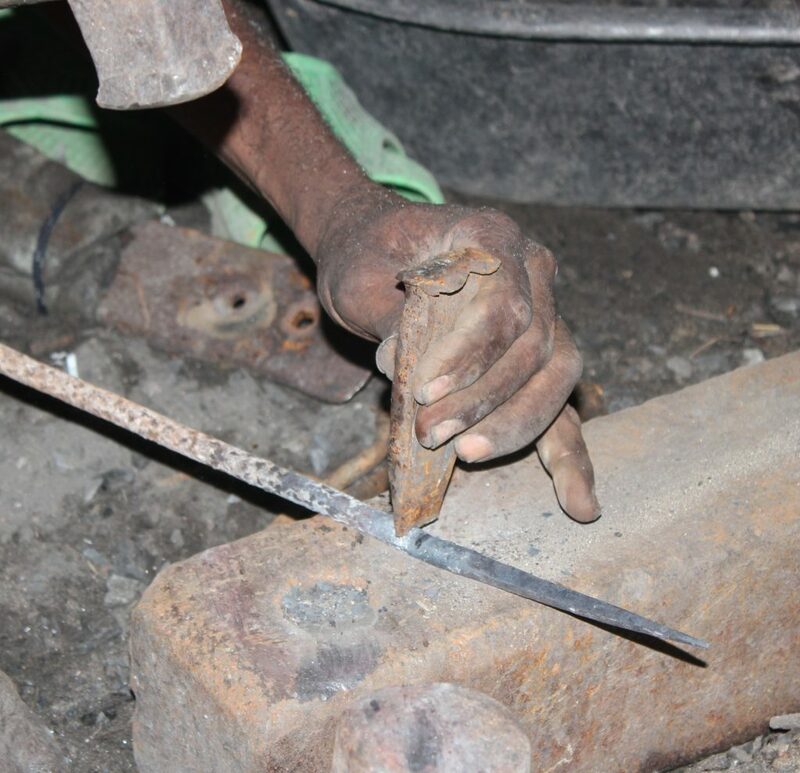 He very generously demonstrated the forging process from beginning to end, starting with a piece of reinforcing rod and ending with a perfectly tapered and headed spike. He also challenged our son to make a nail who did so with modest success after some coaching. The smith’s forge was a small hole in the ground into which two metal pipes had been inserted to provide forced air to the fire. 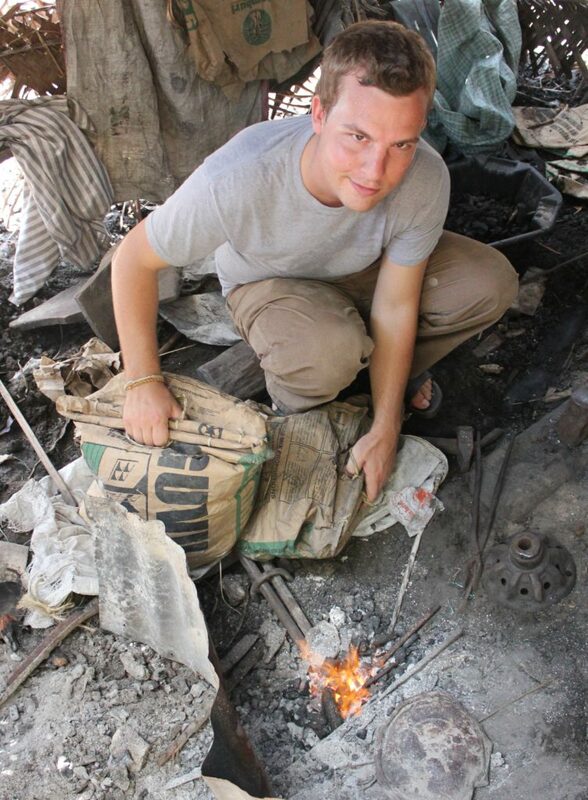 The fuel for the forge was charcoal and the bellows were made from two modified plastic lined cement bags. The bottom of each bag was attached to the end of one of the pipes. The other end of each bag was open; each side of the opening had been sewn to a straight sticks that formed a crude but effective valve. 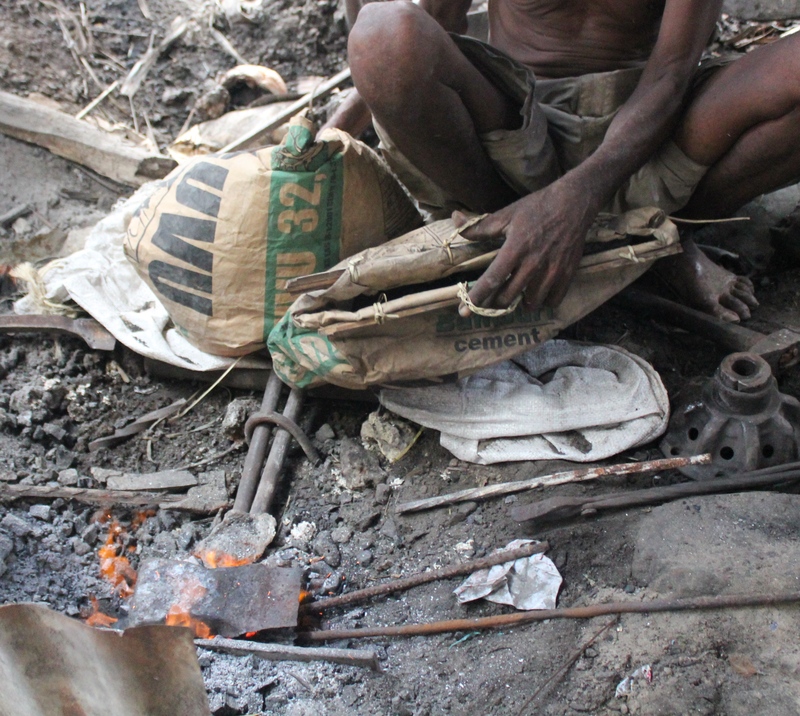 The bag was filled by lifting the open end, closing the sticks together and compressing the bag to push air into the pipe and then into the forge. By operating one bag in each hand, the smith was able to provide a continuous flow of air as shown in the photo below. 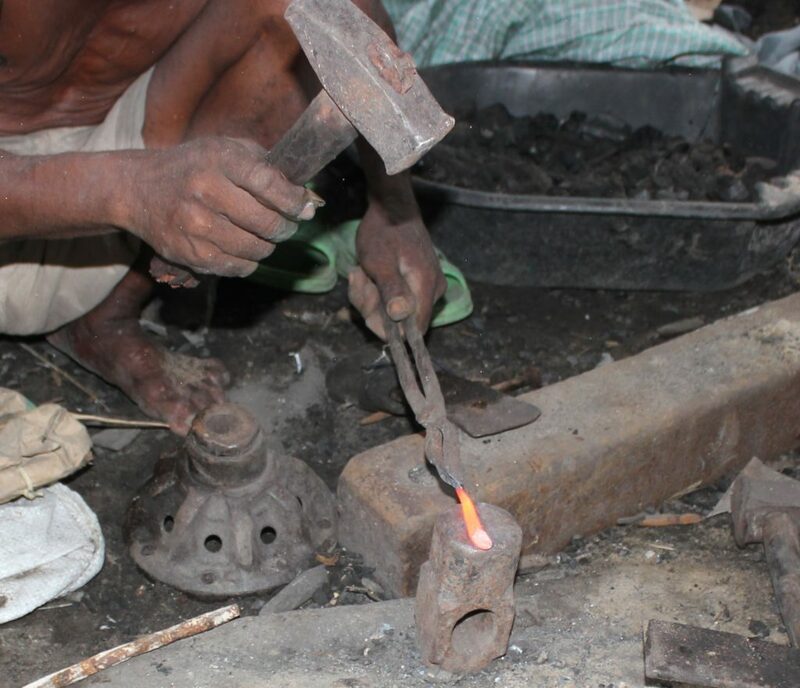 Note the great care that he has taken to economize on charcoal and maximize the forge fire by placing a small piece of metal over the fire to concentrate the heat. In the lower left-hand corner note the piece of corrugated steel roofing that was moved around to minimize the effect of wind. 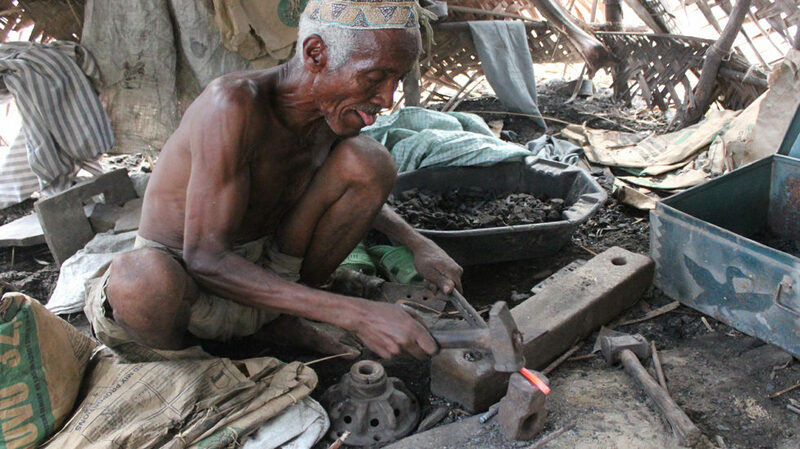 His improvised bellows and minimalist forge. 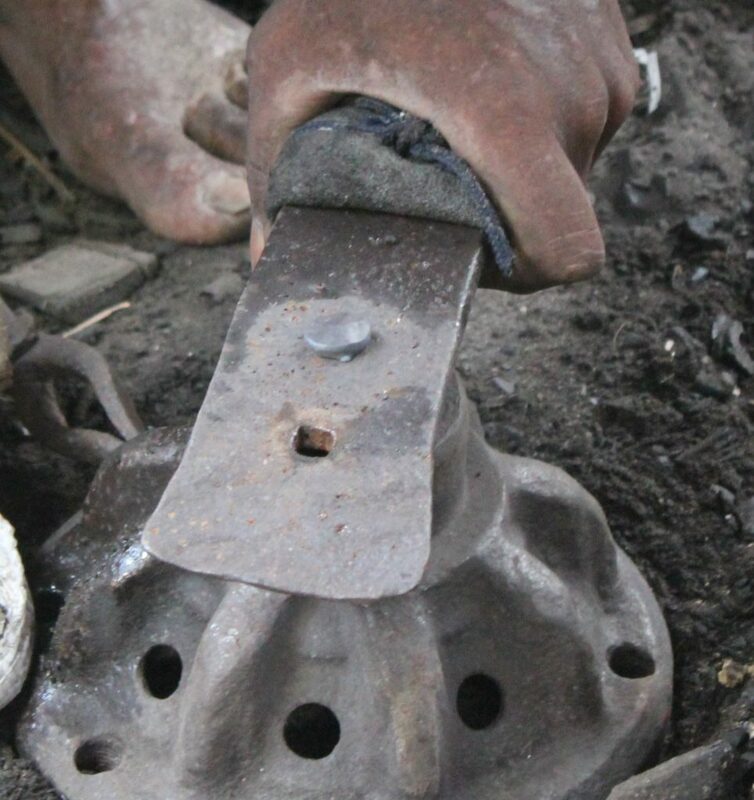 The forging process started with the heating of rebar in the forge as shown above, drawing it out using a partially buried sledge hammer head as an anvil. Drawing out and shaping the shaft of the nail. 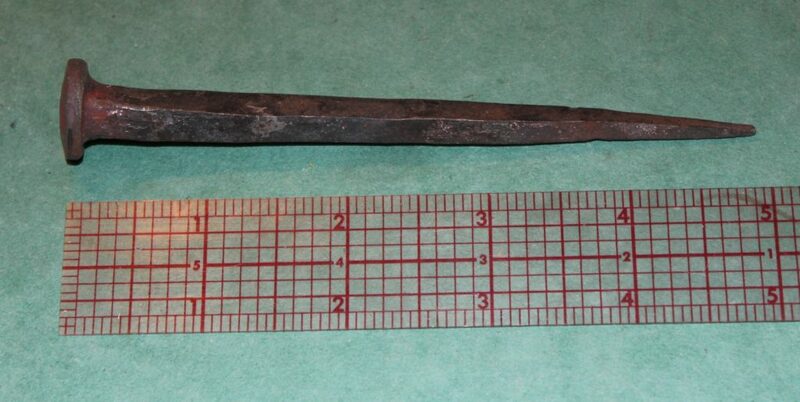 The piece was straightened and partially cut with a hot chisel on the 3” x 3” steel bar beside the smith. Hot cutting. The lighting suggests the material was cold. It wasn’t! 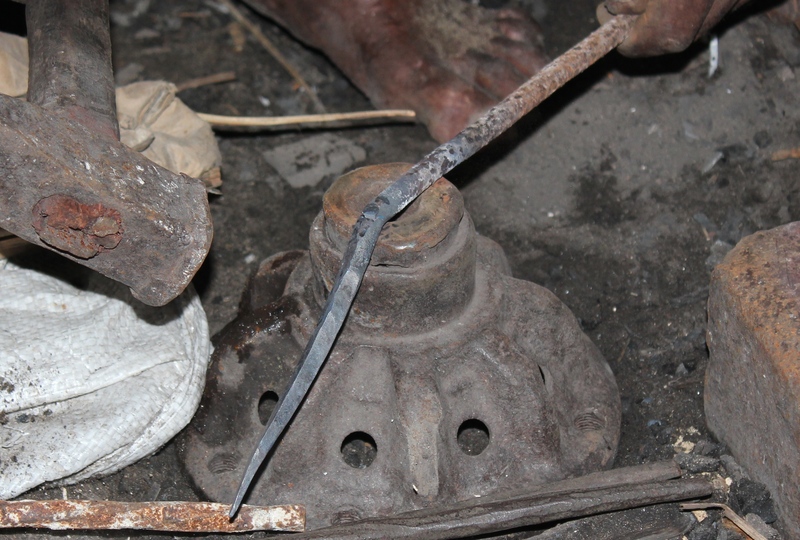 and bent off on the discarded casing for a vehicle axle end as shown below. The hot nail is upset at the head end. Using a hole in a truck spring as a nail header. and resulted in a very neat rose-head on a 5 in. spike. The final product was very clean, neat and professional and had taken less than 10 minutes….with very little fuel. I was very interested in how the spikes were driven into the boats since it appeared that a small pilot hole would result in splitting when the spike was fully pounded in place and a larger hole would potentially leak. Much to my surprise each hole for a spike is typically drilled with three or four bow drill bits in sequence corresponding to the taper in the spike. Consequently the spike doesn’t split the wood, holds well, and is virtually leak proof. Drilling a nail hole with a bow drill. 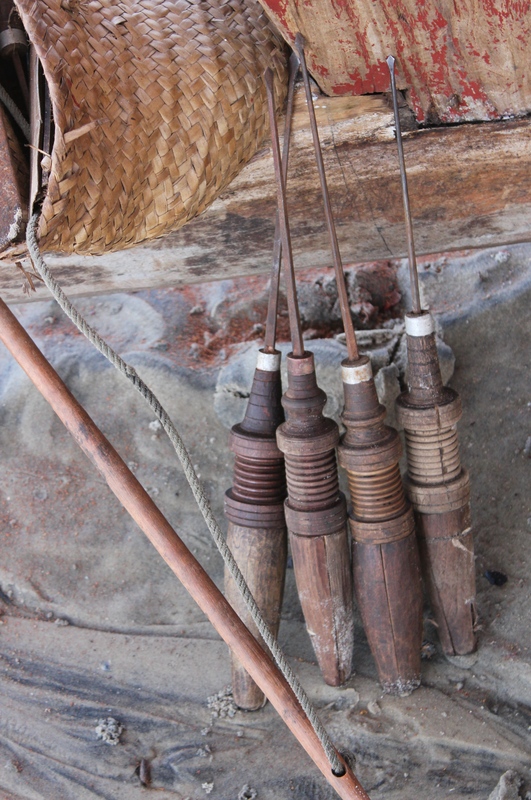 A bow with the four bits used in sequence to drill the tapered hols for a spike. Note that the entire spindle was replaced rather than just the bit. We left Matondoni with a great deal of admiration for the quality of craftsmanship with very basic tools…and little bit of practical experience with bellows we never imagined existed. A classic case of innovative “making do”, something for which blacksmiths have been known for times immemorial. An new apprentice tries his hand at the bellows….and found them very effective after learning the rhythm. Thanks for this very interesting post. Necessity is indeed the mother of invention!